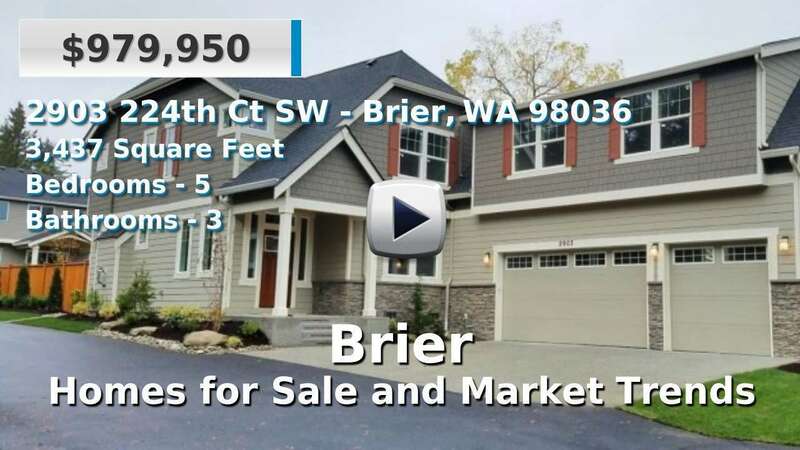 Brier is a city of 6,300 residents in Snohomish County. It sits north of Lake Washington and just a few miles inland of the Puget Sound; neighboring cities include Lynnwood, Mountlake Terrace, Shoreline, and Bothell. The city is mostly suburban residential and has newer than average homes for sale. It strives to maintain its green space and small town feel, though it is just 15 miles north of Seattle and surrounded by the Pacific Northwest's largest metro area. 4 Beds | 2.5 Baths | 2933 sq. Ft.
4 Beds | 2.5 Baths | 3900 sq. Ft.
4 Beds | 3.75 Baths | 4390 sq. Ft.
4 Beds | 2.75 Baths | 2900 sq. Ft.
3 Beds | 1.75 Baths | 1324 sq. Ft.
5 Beds | 2.5 Baths | 2866 sq. Ft.
4 Beds | 2.75 Baths | 3057 sq. Ft.
4 Beds | 2 Baths | 1452 sq. Ft.
4 Beds | 2.5 Baths | 3605 sq. Ft.
5 Beds | 3 Baths | 2713 sq. Ft.
5 Beds | 2.75 Baths | 2732 sq. Ft.
3 Beds | 1.5 Baths | 1604 sq. Ft.